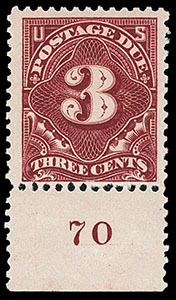 Postage Due, 1884, 10¢ red brown, o.g., never hinged, exceptional centering within nicely balanced margins, rich vibrant color and very fresh, Extremely Fine to Superb, this being one of two examples to receive this grade with only one grading higher (at 98); with 2009 P.S.E. certificate Graded (XF-Sup 95, SMQ $4,200). 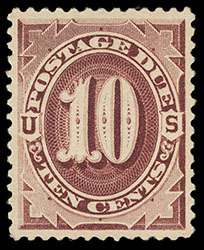 A MAGNIFICENT NEVER HINGED EXAMPLE OF THE 1884 10¢ POSTAGE DUE ISSUE. Postage Due, 1895, 3¢ deep claret, bottom margin single with plate number, o.g., never hinged, intensely rich color, very fresh, F.-V.F. ; with 2010 P.F. certificate for strip. 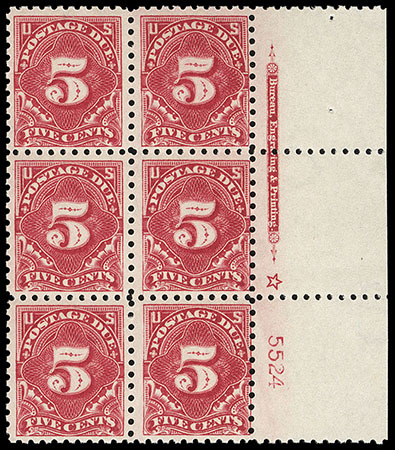 Postage Due, 1914, 5¢ carmine lake, right margin plate no. "5524" block of 6 with imprint and star, o.g., never hinged, radiant color, Fine. 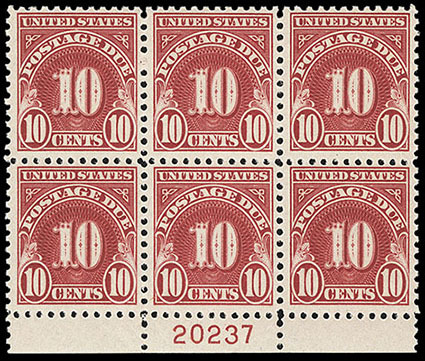 Postage Due, 1930, 10¢ carmine, bottom margin plate no. "20237" block of 6, o.g., never hinged, fresh with strong bright color, F.-V.F.